TagRunner brings you ID3 tags, cover pictures & lycrics for your music! 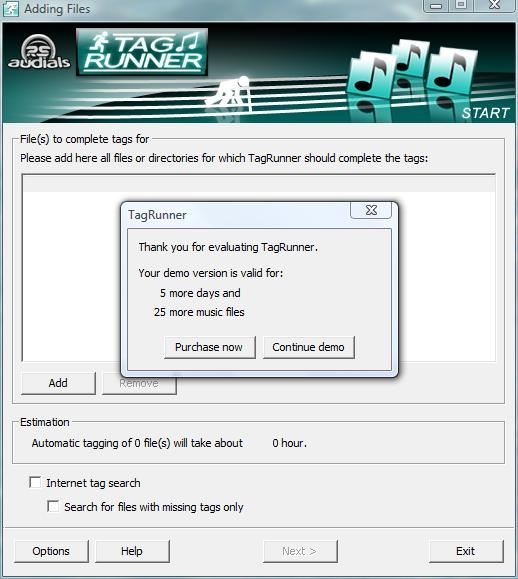 TagRunner painstakingly searches for and retrieves automaticly all of the missing information for every piece of music in your collection. TagRunner automatically and simultaneously searches for your missing tags in more than 10 of the world's largest information sources. No other software solution puts this powerful feature at your fingertips. TagRunner searches through the most important sources on the internet to find not only the missing information for all of your music, but also matching album cover artwork and even corresponding lyrics.In addition, TagRunner provides you with an intuitive interface for manually editing tags that lets you fine-tune music details to meet your specific needs.